There is a growing tendency, both in academic literature as well as in popular culture, to distort history and alter or add historical facts to serve political and often communal ends. More often than not, such distortions are made to demonise the Muslim community or to undermine their contribution to history and to the exercise of nation-building. 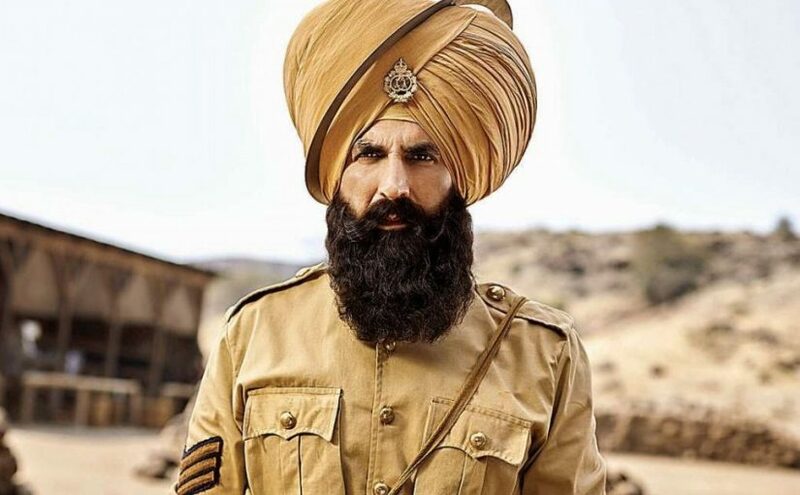 The latest in this long line of distortions of history is the film Kesari, which claims to be a historical account but irresponsibly and deliberately adds facts and a narrative that spread Islamophobia while borrowing characters and events from history. There is no doubt or dispute that the last stand of 21 soldiers of the 36th Sikh regiment at Saragarhi in 1897 was an admirable act of valour. 21 men knowingly embraced death in the line of duty, fighting against formidable odds. The purpose of this article is not to undermine their sacrifice, merely to get some facts straight. The “uprising in the North-West frontier”, as British historians call it, was a war by Indian people against British colonial rule. Saragarhi, the scene of battle in Kesari, is located in the North-West Frontier Province (NWFP) in what is today Pakistan and was, at the time the battle took place, very much a part of undivided India. The Orakzai and Afridi Pathans who attacked Saragarhi were inhabitants of Tirah Valley in the NWFP. They were as much Indian freedom fighters as Khan Abdul Ghaffar Khan (better known as ‘Sarhadi Gandhi’) who adopted peaceful means to fight the British rule in the same NWFP region starting a mere 14 years after the Battle of Saragarhi. The two-nation theory that resulted in the formation of Pakistan did not find place in mainstream political discourse for another 35 years after the Afghan uprising of 1897. In 1891, six years before this battle, the British carried out the Miranzai expedition where they occupied the Samana range in the Tirah region of the NWFP to bring the Pathan tribes under their control. As part of this expedition, they occupied the Pathan village of Saragarh and destroyed the village to build a fort, finding it a strategic position commanding a view of the landscape around it. The British also destroyed neighbouring villages and hamlets to make Saragarhi and neighbouring forts more secure. Local recruits could not be used to attack and destroy these villages, since Pathan soldiers hired by the British were found to hold kinship above loyalty to the Crown. So, the British imported Sikh soldiers to the NWFP as they were seen as the other ‘martial race’ that could combat the dauntless Pathan warriors. British historical accounts of the period indicate that Sikhs were selected for this purpose because of the unfailing loyalty they had displayed during the mutiny of 1857, when other native soldiers rebelled against the Crown. The 36th Sikh regiment that was engaged in the Battle of Saragarhi was in fact formed after the lesson learnt during 1857 – that Sikhs were fearless soldiers who remained unfailingly loyal to the Crown. Historian after British historian writes how Punjab became the recruiting ground for the British Indian Army after 1857 because it remained untouched by the mutiny and Sikh soldiers remained loyal to the East India Company while other native soldiers waged the ‘First War of Indian Independence’, as we now call it. The Sikh…was originally invented to combat the Pathan. His religion was designed to be diametrically opposed to Mahommedanism. It was a shrewd act of policy. Fanaticism was met by fanaticism. Religious abhorrence was added to racial hatred. This was how soldiers of the 36th Sikh found themselves stationed at Saragarhi Fort. In 1897, the Pathans of the Orakzai and Afridi tribes joined forces to chase the British out of their homelands. This is how the battle of Saragarhi came about, as much a freedom struggle by Indians against British Rule as the Revolt of 1857 itself. 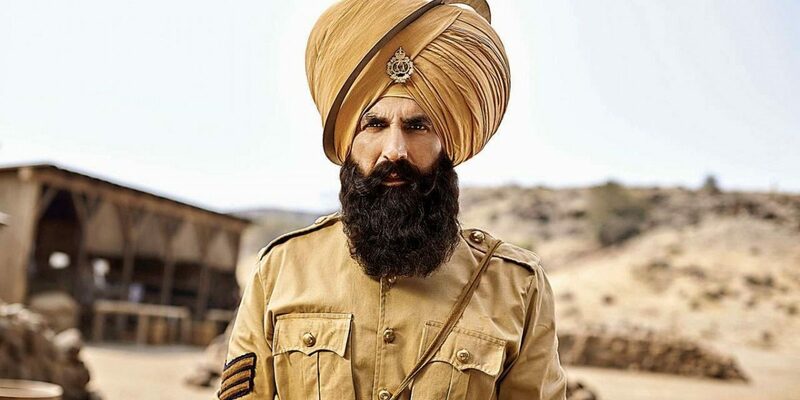 Kesari adds a fictional sequence in the beginning of the film, where Havaldar Ishar Singh (Akshay Kumar) rescues an Afghan girl from a Mullah who wants to behead her for violating the supposed duties of a wife to her husband supposedly mandated by shariat. The film shows that the Pathan attack on Saragarhi was a reprisal against this interference by Ishar Singh in the Pathan tribe’s internal affairs. In fact, in the film, the battle begins with the said Mullah, now riding ahead of the Pathan Lashkar, dragging the same girl to the Fort of Saragarhi and beheading her in front of Ishar Singh’s eyes to show him what he and his men are being punished for. Both scenes have the Mullah reciting Surah-e-Fatiha, the first verse of the Quran which is recited five times a day by practicing Muslims as part of namaz, to associate this barbarism with Quranic injunction. The verse, an uncontroversial one, which seeks guidance of Allah and prays to Him to show us the way, is as misplaced in the scene as the Gurbani would be in a slaughterhouse, but is added anyhow on the (I must admit well-founded) premise that the audience would not know better. Contrary to any historical record, Ishar Singh then lies to the garrison stationed at Fort Saragarhi and tells them that the British commanding officer has asked them to abandon the fort and retreat. He later tells a jawan that he did this so that the soldiers choose to stay to fight to the death not on account of orders of a colonial master, but as free men. 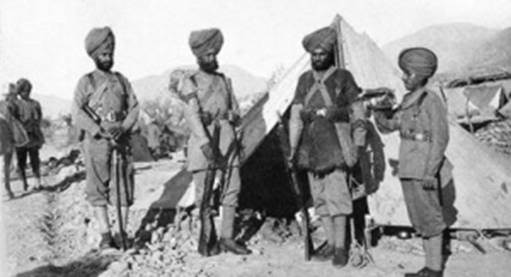 Not content with depriving the Pathans of their rightful status as freedom fighters, words and phrases such as azaadi, apni mitti and qaum are sprinkled liberally in the dialogues of the Sikh soldiers from here on, so that the narrative is actually reversed with the British colonial army adopting the language of freedom as they fight native warriors while irony dies a thousand deaths. The bare boned facts of the actual battle sans jingoism were these – outnumbering the enemy, the Pathans repeatedly offered safe passage to the besieged Sikh soldiers of the British Army manning the fort, but the proud Sikhs bravely chose to fight to the finish. The Pathans, armed with jezails(handmade gunpowder based rifles) and swords threw themselves at the fort against the superior fire power of the enemy. 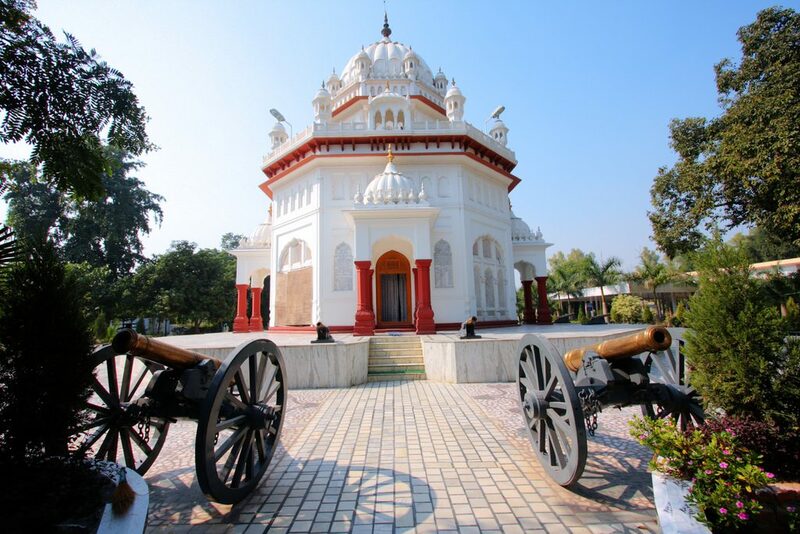 The soldiers of the 36th Sikh regiment, with the advantage of altitude and the safety offered by the fort walls, fired relentlessly at them with their Martini-Henry breech loading rifles, among the most modern guns of that time, capable of firing 20 rounds per minute. Around 180-200 Pathans lost their lives and yet, more surged forward. Two Pathans, braving enemy fire, managed to reach the fort walls and dug down to the foundation of the wall with their bare hands till the wall, foundation removed, collapsed under its own weight. The fort breached, the Pathans stormed the fort and slaughtered the Sikh soldiers who had claimed so many of their kinsmen. The 21 gallant Sikh soldiers died fighting to the last. Dead men tell no tales and since none of the Sikh soldiers survived, it’s only natural that creative liberty will have to be taken to fill in details of how the battle occurred. However, the film goes contrary even to records that do exist, such as the diary maintained by Lt Colonel John Haughton, the commanding officer of the 36th Sikh, which was reproduced in his memoir written by Major A.C. Yates in 1900. Facts are altered to glorify the narrative, falsifying it further in the process. For instance, the offer of safe passage by the Pathans to the Sikhs is shown as a ruse to get two Pathans to the fort walls, which is contrary to the record. Then there is no record of use of dynamite by the Pathans as the film depicts; the wall of the Saragarhi Fort was in fact breached by the two Pathans digging under the wall with their bare hands. These diggers were clearly visible from Fort Gulistan, which tried to signal to Saragarhi, but in vain, and this fact finds mention in Haughton’s diary. The last survivor, Gurmukh Singh, after valiantly shooting down to his last round from the signalling tower, is reported to have shot himself. In the film, a burning Gurmukh emerges from the tower, grabs Gul Badshah, the leader of the Orakzais, and sets fire to his gunpowder reserve, killing him. Gul Badshah was in fact, not killed in the battle. Nor was Mullah Hadda, the cleric who, according to historical record, is supposed to have given the call for jehad against the British in the Tirah valley. In the film, he is stabbed to death by Akshay Kumar’s character. Which brings us to jehad, that forbidden word of our age. The word is slipped in neatly in the opening introduction, spouted by the evil, woman-beheading Mullah. In a moment of rather unusual candour, he admits to the jirga or tribal council that a call to jehad is his weapon, a tool employed by him for his own purposes. The rhetoric of Islamophobia is now complete. Lest we forget, the revolt of 1857 was led by Muslim ulema (clerics) who gave a call for jehad against the British rule, and paid for it with their blood. It is said that there was not a single tree on the Grand Trunk Road from Delhi to Calcutta on which an alim‘s (singular of ulema) body was not found hanging after the revolt was quelled. We must bear in mind that every army fought in the name of their god, which was reflected in their war cries such as “Har har Mahadev” and “Jai Bhawani” of the Marathas and “Bole so nihal, sat Sri Akal” of the Sikhs. To this day, regiments of the Indian army go into battle with these and other religious war cries. I suppose it helps a soldier facing death to believe that a better life awaits him in another world as reward for his sacrifice. Why is this film a concern? So why is this film a cause for concern? It is after all, just a film. Films are meant to entertain, nothing more. It is an exercise by the makers of the film of their fundamental right to freedom of expression. The film is worrisome because it spreads Islamophobia. It creates a false context to a historical battle to tell a story in which the Muslim is the ‘other’. It creates a narrative that further alienates Muslims and incites ill will against Islam. Since inciting ill will against a community is an offence under the Indian Penal Code, this would fall under the restriction to the freedom of expression on the grounds of ‘public order’. I would argue that such a narrative that alienates one community also undermines the integrity of India, another ground for restriction on free speech. It is also a violation of the rights of the Muslim people to equality, as it adds to communal hatred which then results in discrimination against them. And lastly, when a film purports to depict history, there is an obligation to report correct facts, so far as known from historical record. Kesari is supposed to have made close to Rs 200 crore in revenue. That means that nearly one crore citizens have watched this film in theatres, and crores will watch it still for years on TV. Films touch a larger number of people and leave a more lasting impression than any history book. From here on, in popular imagination, this will be the history of the Battle of Saragarhi. The freedom struggle of the Pathans will be lost forever and they will be seen as treacherous barbarians fighting to uphold bigotry and misogyny, supposedly inspired by Islam. 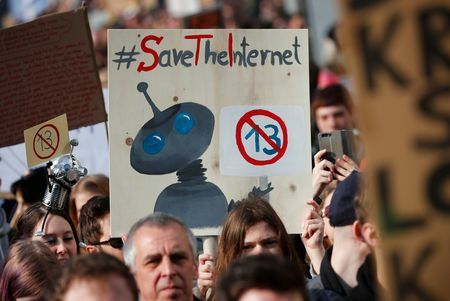 I think the time has come for our courts to carve out a right against distortions of history from the right to information and the right to education, particularly of future generations, who will grow up believing these canards to be historical facts. It cannot be that Akbar wins or loses the Battle of Haldi Ghati depending on who wins the elections, 450 years after the battle. The Central Board of Film Certification (or “Censor Board”, as it is popularly known) must be charged with a responsibility to ensure that films claiming to be based on historical events or employing historical characters must remain true to historical accounts and must not give the story a political or communal colour while filling in the details. Even if facts are not proactively distorted, as in the case of Kesari, history changes depending on the perspective from which it is told. What perspective we choose reveals our politics. Why is it that there is no Indian film in which the Revolt of 1857 aka First War of Indian Independence is shown from the British perspective? The revolt of 1857 was a treacherous act of mutiny by ingrate native soldiers who bit that hand that fed them, literally stabbing their rightful colonial masters in the back in the name of jehad, gau rakhsha and other such superstitious beliefs. For days, mayhem reigned. British officers were brutally killed, their women raped and their children murdered. Finally, an army of brave Englishmen aided by loyal native soldiers of the Empire fought off the mutineers and restored the rule of Her Majesty, Queen of England and Empress of Hindoostan. God save the Queen. If we do not sponsor such narratives, then we must ask ourselves why we readily subscribe to the Islamophobic narrative of films like Kesari, why in fact we flock to watch such films in droves. In the answer lies the key to understanding the hate crimes and bigotry plaguing our country today.